Mindful doodling is also one of the exercises we do on the Draw Yourself Calm day and comes from the book ‘Mindfulness and the Art of Drawing’ by Wendy Ann Greenhalgh. Find an A4 piece of paper and a pen or pencil. Sit comfortably, holding your pen or pencil as you would normally. Keep the tip resting on the paper. Take a few moments to focus on the feeling of your pen or pencil between your fingers. This is something we do almost every day – we write, we sign our name, we jot down notes but very rarely do we pay attention to how it actually feels to hold a pen/pencil in our hands. What is the surface of the pen/pencil like? Can you hold it so that it feels poised yet relaxed? When you are ready start to make some simple shapes on the paper – all the time keeping your eyes closed. Makes shapes simply because it feels good to make them. Continuous circles, spirals, zig zags….just go with whatever feels good. Keep your eyes closed and resist the urge to peek no matter what happens. 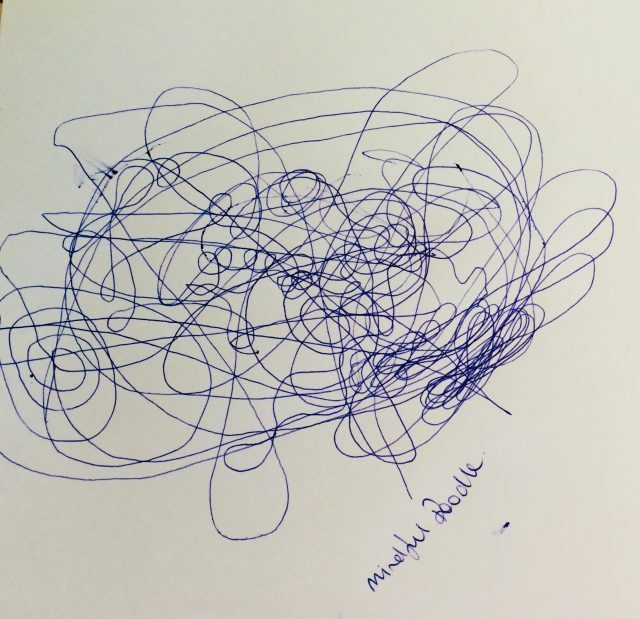 Just doodle….just make marks for the joy of it…instinctive and enjoyable. When you feel yourself getting tired, perhaps a little bored or feel some tension in your body or hand, change something…another shape, your posture, your grip of the pencil or pen. Keep coming back to the sensation of your hand drawing, brushing against the paper and keep doodling until you hear your signal to stop. I use a free on line meditation bell. It is great!